At PNGi we are not just interested in exposing cases of corruption. We want to analyse and understand the systems and mechanisms that are used to unlawfully drain the public purse and to identify practical solutions that can help fix the problems. 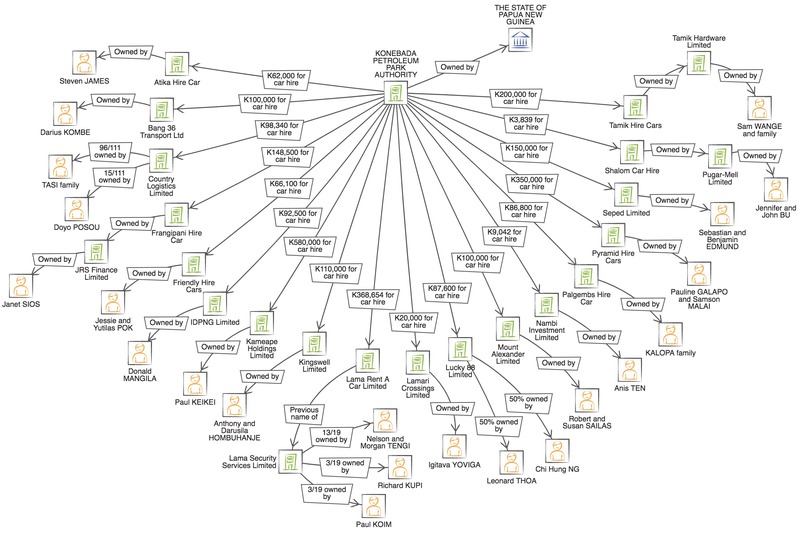 One subject that constantly reappears in our investigations is the hiring of cars by government institutions. In October 2017, we revealed the Konebada Petroleum Park Authority was spending massive amounts of money on car hire, K2.8 million in 2016 alone. That institution has, thankfully, since been wound up. In May, PNGi revealed a similar problem afflicting the Conservation and Environment Protection Authority. 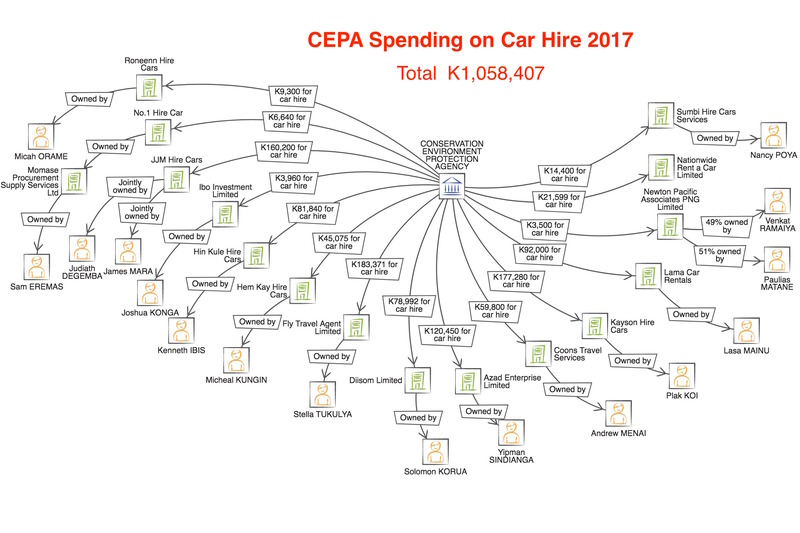 CEPA spent over K1 million on hire cars in 2017. Most of that money went to Port Moresby based car hires businesses, despite CEPA owning a fleet of vehicles for its managers and executives. In one case, K48,990 was paid for a replacement hire car while an office vehicle went in for service! To this line of inquiry, we can now add the revelations from the latest report to be published by the Office of the Auditor General (AGO). This reveals how the hire car curse is afflicting Provincial governments right across the country. A lack of competitive tendering, unregistered business names, exaggerated hire periods and inflated rates are all being exploited to drain government budgets and enrich corrupt officials and their wantoks (relatives). According to the AGO the amounts of money involved runs into the millions of Kina. In East Sepik [p60] “payments totalling K2,803,690 were made to private car companies for hire of vehicles. In the absence of proper procurement procedures, these vehicle hire companies appeared to be handpicked thus resulting in the excessive and unjustifiable hire costs”. In West New Britain [p200], “payments for private vehicle hires during the year totalling K2,042,986 noted as being too excessive and lacked appropriate supporting documents including required three written quotations and proper supplier invoices”. In four instances, the auditor found payment vouchers and relevant supporting documents for vehicle hires totalling K929,547 were completely missing from the files. “Consequently, I am unable to ascertain the legitimacy and validity as well as proper authorization of the claims presented for payment”. In Oro [p166] “payments for vehicle hires during the year totalling K2,505,041 made to a Gee Hire Cars and its associated business G27 Limited. Divisional Heads were approving vehicle hires from the entity although many of the divisions had divisional vehicles that could have been utilised for their own needs and purposes”. In Sandaun [p176 and 177], “vehicle hire payments totalling K1,068,627 paid to vehicle hire companies and individuals were pre-engaged bypassing proper procurement procedure resulting in such excessive vehicle hire costs”. “A total expenditure of K238,712 was incurred on private vehicle hires. The payments were not supported with three written quotations, suppliers invoices, payments were made from wrong budget votes; no consideration was given to the daily rates charge, numbers of days hired and genuine purposes for the hires”. In Madang [p111] we don’t know the total amount expended but the Auditor notes, “excessive expenses were incurred on vehicle hire as there was no control over the hiring of vehicles and the genuiness and economical purpose of hire could not be determined due to lack of supporting documentations or if paid were for services already rendered and as such there were no deliberation on the purpose of hire, number of days hired, rate charge and approval obtained from the appropriate authority”. In Enga [p82], excessive expenditure on vehicle hires was just one example of a “lack of adequate controls over expenditure appropriation which resulted to large amount of expenses on motor vehicle purchases and private hires and increasing associated costs on fuel and maintenance”. Similarly, in Morobe [p125] the Audit report does not disclose the total amount spent on vehicle hire but does highlight a particular payment that aroused suspicion. “An advance payment of K40,000 was made to Prime Travel Services for travel expenses including airfares, vehicle hire and accommodation for officers of the Provincial Government. These payments were seen to be non-compliance to requirements of proper procurement procedures and the requirement for acquittal stipulated in the Public Finances (Management) Act”. Cleary the problem of vehicle hires being used to unlawfully drain the public purse and steal money is one that extends right across the country. Addressing it effectively could save millions of Kina at a time when education and health services in particular desperately need the money.